WASHINGTON — With as much drama and as many off-field distractions as we’ve seen since the Redskins began training camp in Richmond at the end of July, it’s hard to believe that the 2015 season hasn’t even started yet. There have been a number of changes in this organization since the end of last year, beginning at the top with the hire of a real general manager in Scot McCloughan. He came in saying this team was going to be physical and that teams were going to know that they played the Redskins the next day. He’s held true to his word already. The team drafted Brandon Scherff, an offensive lineman out of Iowa, with the fifth overall pick. McCloughan also signed defensive linemen Stephen Paea and Terrance Knighton, two guys who are going to be very physical along the defensive line. As it seems to always be with this team, the big question is going to be: Will Dan Snyder step back and allow McCloughan to do his job? Where do I start? We’ve been down this road all offseason. Whether Kirk Cousins won the starting job or Robert Griffin III lost it, Kirk will start the year and Griffin could be the backup after he is cleared from concussion protocol. There are still major questions at this position, and Jay Gruden has convinced his superiors that he cannot win with Griffin. What happens if Cousins struggles out of the gate? Will Gruden go back to Griffin? Could we see Colt McCoy take over the reins? A lot of questions remain, and I don’t know whether we will get answers to them by the end of the season. This could be a big bright spot. Alfred Morris is set to have a big year with the bigger offensive line. Brandon Scherff and Morgan Moses will have growing pains on the right side of the line, but in the end they should be pretty good. Morris will get help from rookie Matt Jones and third-down back Chris Thompson. This should help set up play-action, which in turn could result in big plays from DeSean Jackson and Pierre Garcon. If tight end Jordan Reed can stay healthy, he can contribute to the passing game as well. This should help take pressure off the shaky quarterback situation. The Redskins have already suffered a number of season-ending injuries to key players this preseason, such as special teams standouts Niles Paul and Adam Hayward. Newly signed linebacker Junior Galette suffered a torn Achilles. The side of the ball that saw the most changes was the defense. The Redskins said goodbye to Jim Haslett as defensive coordinator after last season and hired Joe Barry. The team also got bigger on the defensive line in hopes of getting after quarterbacks a little more. The signings of Terrance Knighton, Stephen Paea and Ricky Jean-Francois aim to solidify that. The secondary is still a question mark, but there were some upgrades there as well. The additions of cornerback Chris Culliver and safety Dashon Goldson bring some experience to help DeAngelo Hall, Duke Ihenacho and David Amerson. The other big question mark will be at linebacker. Can second-year player Trent Murphy step in and fill the role vacated by Brian Orakpo, and even more recently by Galette? Rookie linebacker Preston Smith will be heavily relied upon, too. In the end, there seems to be a lot of energy coming from this group and it starts with the new boss, Barry. Let’s see how it translates on the field. 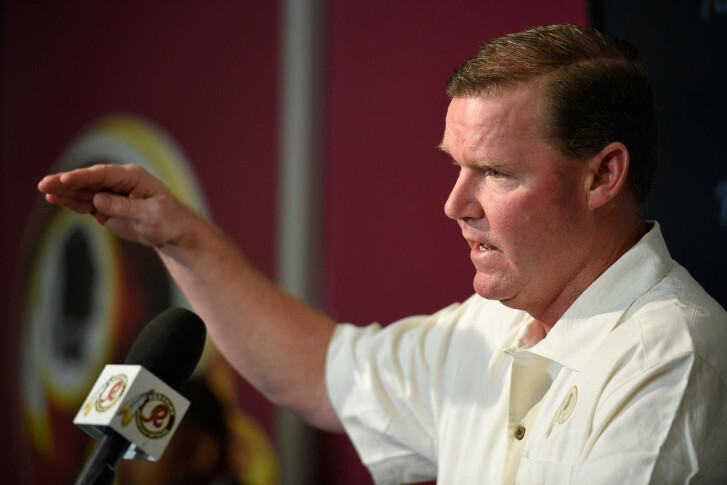 A number of questions surround the 2015 version of the Redskins. Quarterback play is the biggest, but we still need to find out whether Jay Gruden can coach. He’s coming off a 4-12 debut; he’s tied himself to Kirk Cousins, and how the quarterback progresses could very well tell the tale of this season and whether Gruden is around to see the end of it. There are some nice additions to this roster, and McCloughan very well could have them heading in the right direction, but there are still too many holes to see a huge improvement this season. Plus, all the drama we have already witnessed leaves you wondering: What could possibly happen next in Ashburn? Nothing would surprise me one bit.